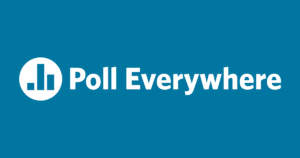 Poll Everywhere is a dynamic online polling platform that allows students to vote on custom teacher-generated polls through text messaging (SMS), smartphone, or computer by visiting this website. With a free educator account with Poll Everywhere, polls can receive up to 40 votes, enough to accommodate most classrooms. There are two types of poll questions that can be used in the classroom: multiple choice or open text. Teachers can easily generate polls to be deployed individually or as a series of questions. All polls can also receive submissions through a combination of devices. Students can text message, vote online with a smartphone, handheld device, tablet, laptop, or computer. Students can respond by following the instructions shown on the poll when it is displayed. They respond by sending a text message to the number provided to them on screen or teachers can get and share a custom url with students to respond in the web app or even through Twitter. Teachers can set preferences for each poll about how they want to allow responses to be sent in. Poll Everywhere can be used as a formative assessment strategy that enhances and amplifies classroom discussion, participation, and understanding. In addition to the quick-serve nature of the tool, site-generated polls can be integrated into PowerPoint presentations for real-time audience participation. Price ★★★★✩ Free plans for K-12 teachers and higher education faculty include 40 responses per question. The free business plan allows 25 responses per question. Paid plans allow more responses per question, along with premium features like moderation, post-event reporting, and a custom URL for your audience response page. Regardless of the plan, the number of polls per account is unlimited. Users are not charged for voting on a poll; however, if they vote by text message then standard text messaging charges apply. Type of learning Constructivism, 21st century skills, Cognitivism, behaviorism Constructivism: Involves active attempts to construct new knowledge. 21st century skills, Cognitivism: Mental processes such as thinking, memory, knowing, and problem-solving are explored. Ease of Use ★★★★✩ Typically there is no need to register or sign up to respond to any poll questions unless polls are being used for attendance or grading purposes. Students can respond to polls even when they do not have a live Internet connection but to display the poll or view results in real time, the presenter must have an internet connection. For children under 13: Does not collect or maintain personally identifiable information on the site or service from persons under 13 years of age, except in compliance with the Children’s Online Privacy Protection Act of 1998 (“COPPA”). Accessibility ★★★✩✩ There is no mention on the website about accessibility features for students with disabilities but you can easily customize the fonts and colors of polls and charts . Access ★★★★★ Tool marginalises educators and students who do not have access to smart devices or the Internet in their classrooms. ISTE Standards for Students Empowered Learner Students use Poll Everywhere as a way to answer teacher generated questions about a certain topic. Teachers provide feedback to students about their learning. Poll Everywhere could be used for in class questions, such as a quick check for understanding, rather than having students raise hands or shout out answers. 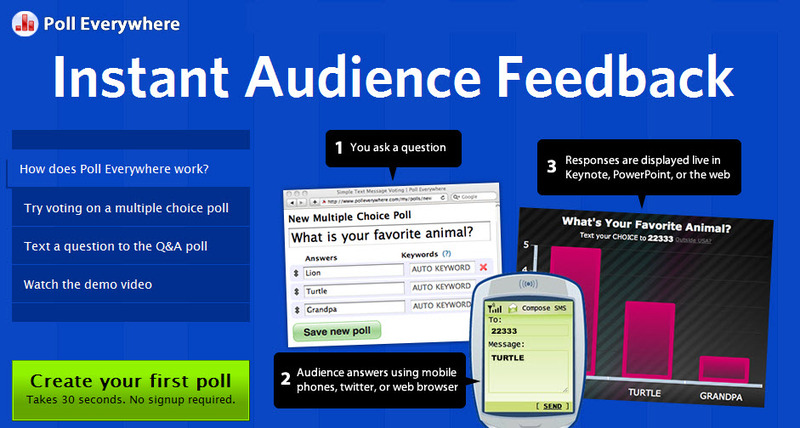 Poll Everywhere can be used for formative assessment to guide a lecture instead of paper and pencil assessment. Teachers can pose questions to students during presentations or lectures using Poll Everywhere and can see instantly if a student hasn’t answered a question. Teacher can get instant result from the whole class and see who has the correct answer and have the student revise their answer. Teachers can share how other students have answered without giving away the correct answer so that students can re-think their answer and change it. Teachers can get Immediate feedback on lessons to keep instruction in line with students’ needs at all times. Anyone from around the world can participate in a poll at the same time. Far too often, technology is used as a direct substitute for other low-tech tools (e.g., pencil and paper). While substitution has some benefits (e.g., students develop their technology skills and knowledge), we encourage you to think about how you might use Poll Everywhere to modify or redefine learning. Ways to use live polling in class to engage and interact with students. Teachers can create polls for incoming beliefs, pre-conceived ideas, and pre-existing knowledge to get a sense of what students already know and think about a topic. Teachers can collect open-ended response data and put it into a word cloud for students to review and analyze. In a college setting, Polldaddy can be used in orientation sessions as a means to interact with hundreds of freshmen at once. Before the class: Teachers can evaluate understanding of homework assignments. During the class: Teachers can assess understanding of lecture content or can use Polls as a discussion starter. After the class: Teachers can create Poll for lingering questions & shape subsequent starting points. By registering students, educators can use Poll Everywhere to administer and instantly grade quizzes. Using the segmentation feature in Poll everywhere, a class can be divided up in groups for any team competition. Teachers can use Poll Everywhere as a voting mechanism in a group peer review exercise. Students can use this feedback to monitor their own learning and instructors can use it to change how they manage class in response to students’ learning needs. Teachers can use polls to ask students to make a prediction and review assigned readings. For example in a literature class the teacher can ask a questions via Poll Everywhere about how the the main character will react to a problem. Or in Math class, the teacher can ask what number will come next in a series? First, present your polling question in class and ask your students to submit their responses without talking to anyone. Stop the poll and do not display the results graph to the class. Now, ask students to turn to the person next to them and discuss the question in a small group and come to a consensus within the small group. Start a new poll, asking the same question, still not displaying the results graph. Instruct your students to now submit their responses based on their group’s decision. Now display the responses and also show the results of the initial poll taken without any discussion. You should see a larger number of students responding with the correct answer after discussing it among themselves. This activity works very well with a question that addresses common misconceptions about a certain concept. Prepare the students. Let them know that they should have their mobile devices handy so they can participate. Display your first poll full-screen. This automatically activates the poll, so you can receive responses. If you’re not going to display it full-screen, click the icon to activate the poll manually. Display the chart, and watch answers appear, live. You can also click the Hide/Show Chart icon to keep results hidden, and display the chart only after responses arrive. This is a good option if you’re concerned that students might be influenced by others’ answers. Use the arrow keys on your keyboard, or the arrow icons at the bottom of the poll chart, to move to the next poll. As soon as it displays full-screen it will take over as the active poll, so that everyone can follow along on their phones, tablets, or laptops. Kappers, W. M., & Cutler, S. (2014). Poll Everywhere! 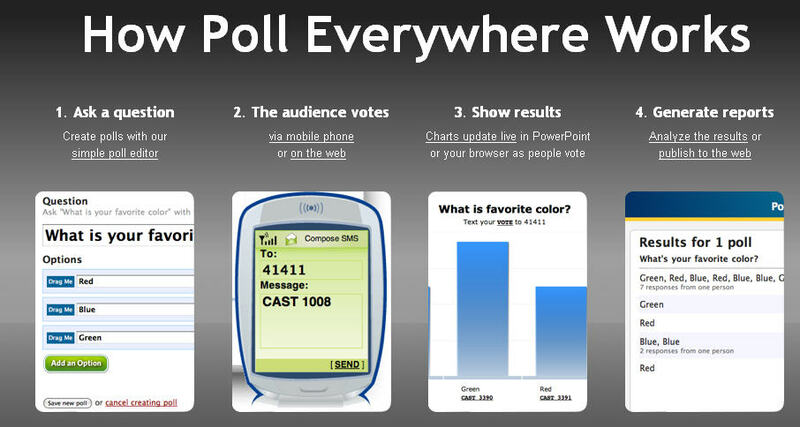 Even in the Classroom: An investigation into the impact of using PollEverywhere in a large-lecture classroom. In 2014 ASEE Annual Conference. Shon, H., & Smith, L. (2011). A review of Poll Everywhere audience response system. Journal of Technology in Human Services, 29(3), 236-245. Sellar, M. (2011). Poll everywhere. The Charleston Advisor, 12(3), 57-60.